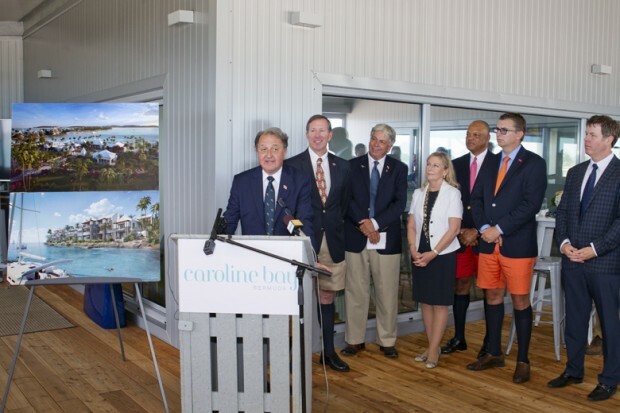 “We are deeply honored to become members of the fiber of this great destination and to enhance the glamour of Bermuda not only for today’s most affluent travelers, but for Bermudians,” said Herve Humler, President and COO of The Ritz-Carlton Hotel Company, L.L.C. The Premier said, “Good afternoon to my Ministerial Colleagues and members of the Economic Development Committee; to my Parliamentary Colleagues; to the Morgan’s Point leadership, Craig Christensen, Brian Duperreault and Nelson Hunt; to all the site workers and special invited guests. “I’d like to extend a very special welcome to the President & Chief Operations Officer, of the Ritz-Carlton Hotel, and the President of Bulgari Hotels and Resorts – Mr. Herve Humler. He is also joined by Katherine Monahan Market Vice President for the Ritz Carlton and Graeme Benn the area VP Sales and Marketing. “As you are aware, Mr. Humler is one of the original founders of the Ritz-Carlton Hotel Company when it was created in 1983. Currently in his role at the operational helm of the iconic luxury hotel company, Mr. Humler is guiding the Ritz-Carlton through a period of unprecedented growth and evolution. 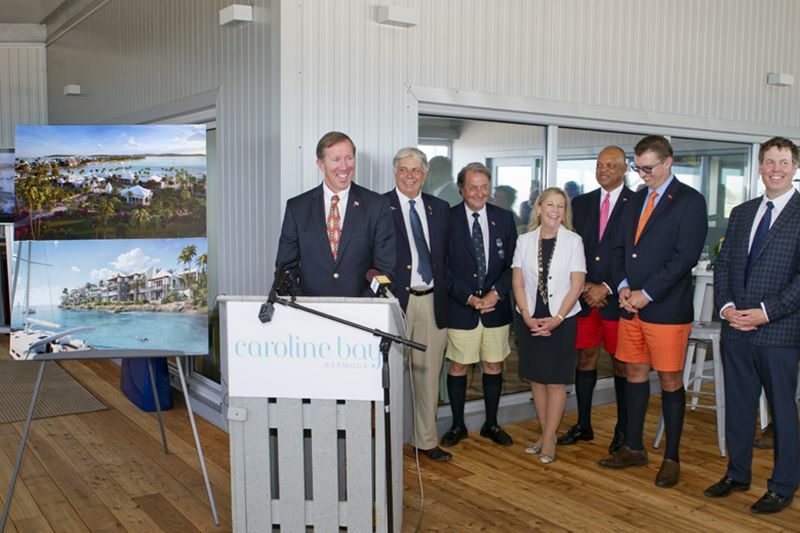 “The Ritz-Carlton is branching out on all fronts with significant global expansion and Bermuda is proud to be a part of this innovative growth and development with such an iconic brand. 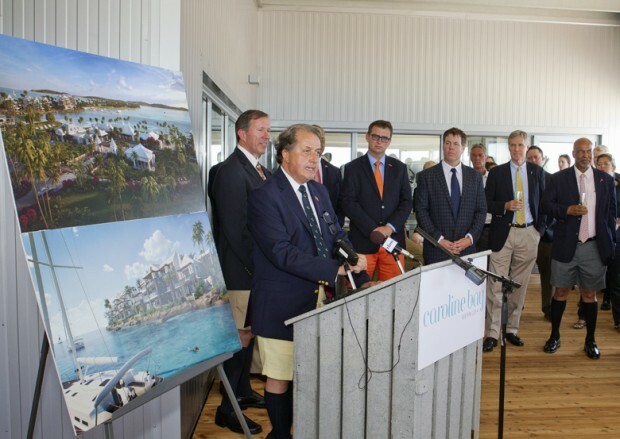 “I just want to note that Mr. Humler’s dedication and loyalty to Bermuda goes beyond overseeing and building hotels. In fact in the early 1970’s he started in the industry by working in Bermuda at the Hamilton Princess Hotel. “Earlier this morning I had the pleasure of hosting Mr. Humler and colleagues in the Cabinet Office. It is evident that Mr. Humler is passionate about the industry, the Ritz brand, the ability for them to provide experiences people seek and his passion for the success for all 45,000 employees. “The people of Bermuda will find that The Ritz brand in Bermuda will provide significant opportunity for Bermudians and on a future visit Mr. Humler will visit students to illustrate the hospitality opportunity. So Mr. Humler, thank you for commitment to Bermuda and imparting your knowledge and insight to our young people. “Ladies and gentlemen, it is important that I provided an overview of Mr. Humler’s passion and the philosophy in Ritz Carlton brand – he is a well-respected, committed leader and the Ritz Carlton have invested in Bermuda for our mutual success. From Government’s perspective, this project is so much more than just bricks and mortar. “Caroline Bay is a sign hope… and a sign of greater things on the horizon for our Country and for our people. It’s about keeping our promise of stimulating an environment that will generate the creation of jobs for Bermudians. It’s about helping to inject new life into our tourism product by providing the necessary support to visionary entrepreneurs. “The construction of Caroline Bay will benefit our vital industries of hospitality, construction and other critical sectors that drive our economy. I’m sure those of you involved in this project will agree with me that this has truly been a journey – with a considerable amount of time, work, energy and effort undertaken to get us to this point. A five star ‘Boutique’ 79 room Ritz Carlton Reserve Hotel. 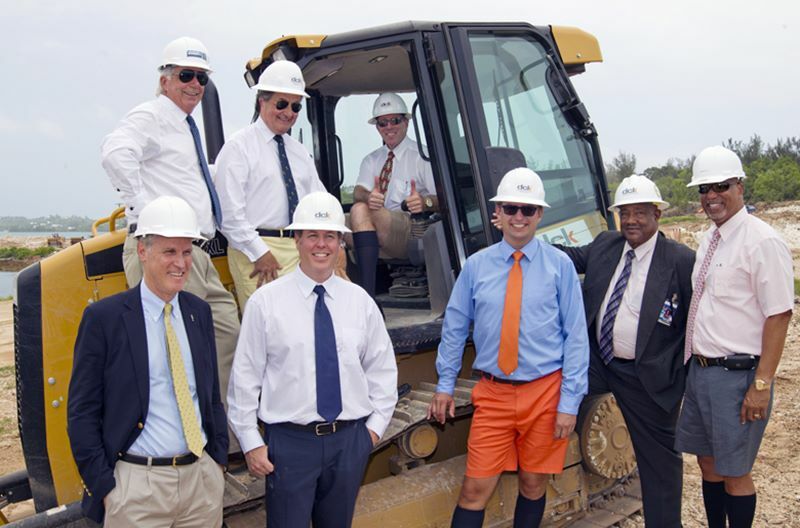 “Ladies and gentlemen I am extremely encouraged by the progress we have made to date with this project, and our entire Island should feel excited about the significance of Ritz Carlton’s demonstrated confidence in Bermuda. I want to once again on behalf of the Government and the people of Bermuda to extend my tremendous thanks to Craig Christensen, Brian Duperreault and Nelson Hunt. 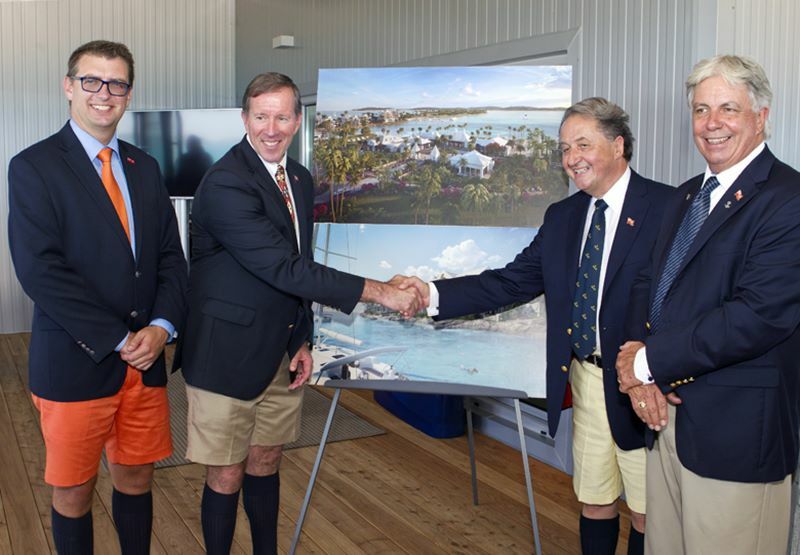 “In the face of adversity they continued to persevere, because they knew this unique development would benefit Bermuda for generations to come. And finally to Mr. Humler – once again, we welcome you, we thank you and we are so appreciative of what you have done for Bermuda. Mr Christensen said, “I would like to welcome our distinguished guests at the podium. The Honourable Premier Michael Dunkley, Herve Humler, President and COO of The Ritz-Carlton Hotel Company, Senator Michael Fahy, Minister of Tourism and Transport, Nancy Duperreault, principal and wife of partner Brian Duperreault, Nelson Hunt partner, Chris Barbe, Senior Vice President of dck Worldwide and Andy Burrows, Chief Investment Officer with the Bermuda Tourism Authority. “Thank you for being here today. I also want to acknowledge the Ministers, MP’s and Senators in attendance and extend a welcome to them and all of our notable guests. “Over 10 years ago, Nelson Hunt and I stood at the balcony of Dapples at Southlands. I asked Nelson “what’s your vision for this spot” overlooking South Shore. And then I said “it will look nothing like that” who would have thought that it would end up being a national park. “Who would have thought that we would meet Brian Duperreault to join us in the journey and be the wonderful supportive partner he is, along with his wife Nancy who is here today immersed in the vision and operations of Morgan’s Point, who would have thought. Who would have thought, we now have grandchildren and me with a new wonderful and supportive wife. “We are now standing here at the Artemis Racing Team’s home base as part of the America’s Cup event. We have been proud and grateful to be associated with them, who would have thought. “Then Premier Scott had the vision to suggest to swap Southlands for Morgan’s Point. These talks were kept strictly confidential and today we can disclose that the Government and Southlands sought to develop Morgan’s Point and preserve Southlands. Unknown to BEST we were all working for the same outcome. We have to thank Alex Scott for his support and vision. “The road has been long and hard, but we have always received the support of both sides of the political divide. This is unique, and greatly appreciated. Developed by Bermudians, supported by Bermudians for the benefit of Bermudians. This is Bermuda’s project. 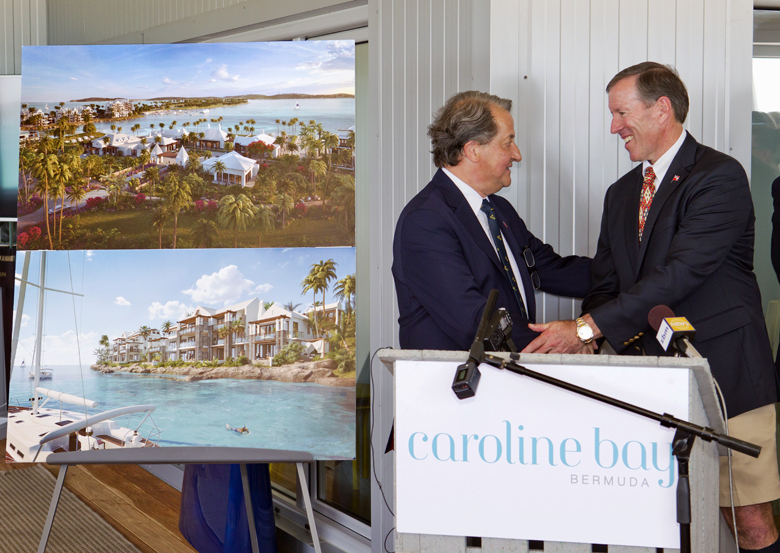 “Today, we are undertaking the development of Caroline Bay, Bermuda which will feature a Ritz-Carlton Reserve and residences. We are indebted to the wonderful support of the entire Ritz-Carlton team. They have been a joy to work with. “Who would have thought we now have a Bermuda Tourism Authority; and Andy Burrows instrumental in assisting the Government and Morgan’s Point in finalizing the financing package. “We must also thank dck Worldwide Construction, who brought the senior lender to the table. We must thank all that are present. Every one of us have had a role to play. Caroline Bay, Bermuda will not provide “jobs” (which stands for just over broke) but rather career positions and opportunities for Bermuda’s future generations. “We truly appreciate the support of our fellow Bermudian’s. We will work to deliver a world class resort for the benefit of Bermuda. As we look to the future, there is much more work to be done. There will be other developments at Morgan’s Point as the Caroline Bay, Bermuda resort represents only 25% of the area of the entire Morgan’s Point development. Perhaps in 10 years from now we can reflect back and say “who would have thought”. This is very good news Bermuda – congratulations to Morgan’s Point Limited. A world class hotel brand in Bermuda and the transformation of a former military base into a resort. It will be exciting to receive updates and pictures of the transformation. What a journey it must be for all involved. By the way Nelson you’re in the runnings hummer…by time! The OBA – working for Bermudians. No way. Any one believing that foolishness is a foreigner, not a Bermudian of THIS SOIL!!!! Remember, we are almost in election mode. This is just a part of the unbelievable ubp/oba stories!!!! You better believe it !!!! Thank you for giving the real credit where credit was due. Former Premier Alex Scott, who was instrumental in the land swap, despite all the negativity from a certain segment of the community. Glad to see after many years, you have stayed to the wicket. Funny…Nelson Hunt nowhere to be seen. Mmmmm. Ritz Carlton, St Regis. Bermuda’s future is looking much brighter these days! $250Million and Casinos when they come $250Million and NO INCREASE in our national Debt. The PLP/BIU gave us $2Billion dollars in National Debt of which we are paying approx. $500 thousand dollars per day IN INTEREST to the people who we borrowed it from. In the photo next to Bob Richards – next question?